The Virgo detector is a Michelson interferometer whose perpendicular arms are 3 km long. It is able to detect a gravitational wave which induces a relative variation of the length of the two arms of 10-19 mètre, which is about ten thousandth of the size of the nucleus of an atom ! The gravitational waves searched for have frequencies between 10 Hz and 10 kHz. Many noises can prevent the detection of such gravitational waves and the mitigation of those noises is a scientific and technological challenge of the Virgo experiment. More details can be found on the Virgo experiment web site. The Virgo interferometer is a project in which LAPP is involved since the beginning of 1990. 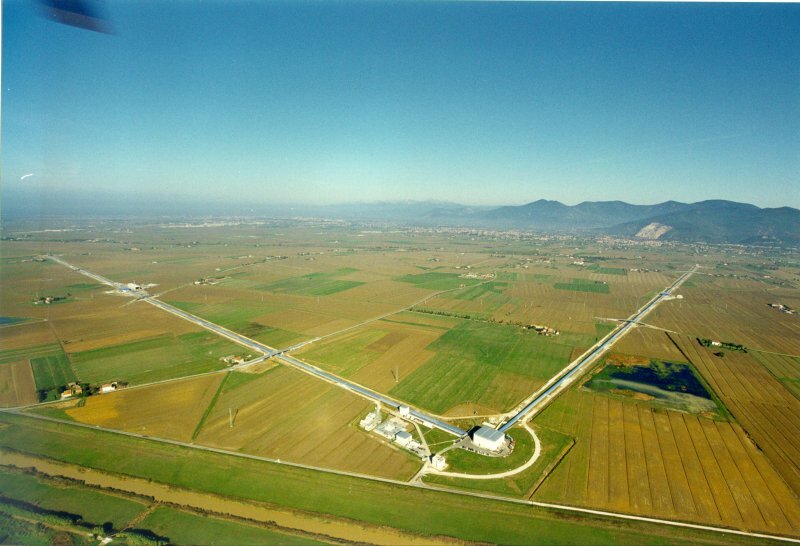 Its funding was decided in 1992 by France CNRS and Italy INFN and it was built in the county of Cascina, near Pisa. The various steps of site acquisition, infrastructure building, installation and commissioning of the instrument have allowed the first scientific run in 2007. The Virgo detector reached in 2011 a sensitivity better than 10-19 m/sqrt(Hz) for frequencies above 50 Hz. This can be translated in an ability to detect gravitational waves from binary neutron stars as far as 40 millions light-years (12 Mpc). In 2011, having reached the limits of what could be done with Virgo as a first generation instrument, the detector’s operation has been stopped in order to proceed with major modifications to improve significantly the sensitivity. The improved instrument, Advanced Virgo, is currently installed and should start to take data during the year 2017.